It sometimes happens that you downloaded a program that seemed very useful at first, but then as you tried to remove it, it became clear that the program has decided to stay on your PC for good. What can we do in this situation? What steps should be taken in this situation? Some programs do have an uninstall wizard that can wipe the unwanted program off your PC’s surface. However, if the program comes without such tool, there is one more common way to use. 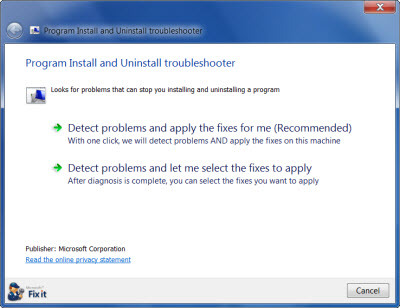 To help PC users remove programs Windows has provided a specialized Add and Remove Programs tool. Unfortunately, sometimes the tool is useless, especially if the program you want to remove is not quite legitimate. Also, the tool might miss some of the program’s elements and these remnants will cause problems for future installations. Moreover, certain stubborn programs can be malicious in their nature and you can be sure that they will do everything to stay on your computer as long as possible to continue carrying out their malicious actions. Spyware programs create numerous files and registry entries making it nearly impossible to complete a full removal. This tutorial will help you deal with such problematic cases by showing you both manual and automatic removals. If you want to remove a certain program, first thing you should try is to remove it through Control Panel. If you have already done that, proceed to the next step. If not, click Start button (you can find it in the down-left corner), then click Control Panel and select Add or Remove Programs link (in some OS it is called Programs). Then locate the program you want to get rid of, select it and click Remove. Then follow the uninstall instructions. Also, you will need to turn off the auto-loading of the program. Click on the Start button, then click Run and type “msconfig” without the quotes in the Command Prompt box. Then you will see a new window. Select the files associated with the program you want to remove and check the box that you can find near to the name, then select Stop. Now click Start, then select My Computer and after that go to C:\Program Files, find the folder of the program and if it is still there – remove it. However, this step is often not able to remove the program completely. There still be some leftovers present on your PC. If you need full removal – continue reading. If the program refuses to uninstall through common methods described above – you have no choice but to get rid of it manually. First of all, you will need to stop all the processes under the stubborn program. Click the three buttons Alt+Ctrl+Del at the same time to open the Task Manager. Then select the processes tab and locate all the processes of the program. To stop them select each one and click End Process button. Now you will need to remove all the files scattered and hidden in your system. Make sure the default options allow you to see hidden files and folders. If not, make them visible. To do that double-click My computer and select Tools. In the drop-down menu select Folder Options. Then click View tab and select Show hidden files and folders option. After the removal you can hide the files same way. Now that you can see all the files present in your system go to the Start menu and type the program’s name in the Search for files and folders line. When the files are found, delete them all. To do that press Alt+A and then right-click each of them. Remove all the registry files associated with the program you want to remove. This step is especially important if you are trying to get rid of a spyware or adware program. They usually hide their files and entries through which they can reinstall themselves. If you suspect that the program is malicious you can also run a full scan with your antivirus. To remove registry files access Registry Editor – a specialized Windows tool that enables its users edit the Windows Registry. Click Start button again, then Run. Type “regedit” in the command box. After that search for the registry keys connected with the program and when found – delete them. However, the unprofessional modifying of the registry may cause serious problems and even system crash. Make sure you have a back up for all the registry files you want to delete. You can also download a reliable Registry Cleaner that will do the task safely. It can remove any type of program including malware and spyware programs. It seems to me that everything is fine with our rss. I will check it.